Jack's Opinion: What makes Apple so successful? 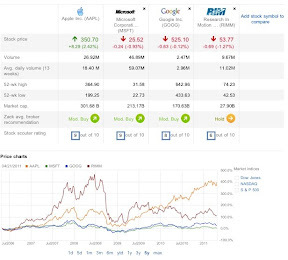 The Apple stock constantly grew since July 2008. Why is July 2008 such an important month? Apple released on July 11th their iPhone app store. Before, consumers were only able to put short cuts of web pages on their phone but no 3rd party apps. All this changed on the 11th. I did blog a while ago that I used to be an Atari user in the 80es but switched to Windows, when I went to university. One of the biggest reason that I chose Windows instead of Apple, was the ability to access software. In the early 90es and even till now, there was much more software available for Windows than for Apple PCs. And everybody I knew at the university had used programs like Word for DOS which was not available for Apple. Apple had the better interface but if you are not a designer or in desktop publishing then there was no reason to spend more money on something which was not compatible with other systems. However I was amazed when I came 1990 to the US and saw many schools using Apple. I guess Apple missed to take advantage out of this. Point is, that not always matters how good a device looks or how perfect the quality is. It matters who has the best Eco System. It was Microsoft in the 80es till end of 2009 and in PCs it is still Microsoft. Apple's first big hit on the market was the iPod. The iPod is a digital music player but Apple was not the first company to sell a digital music player. In 1998, Compaq introduced the first hard drive-based digital audio player. The player had an initial capacity of 4.8 GB, with an advertised capacity of 1,200 songs. Two years later, the upgraded 6 GB NOMAD Jukebox became available. 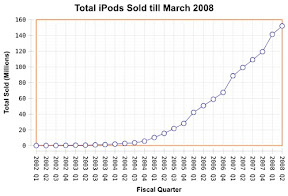 The iPod was released in 2001 but did not have significant market share till Apple released the iTunes Store (introduced 29 April 2003) an online media store run by Apple and accessed through iTunes. Till then there were 100 of different music players but nobody did offer a software to store and to buy music for their music players. Apple got only so successful with the iPod, because of the iTunes Store. There were other nicer players on the market, but they could not access iTunes store. Apple did a great job to build relationships and contract with music industry when everybody was using Napster instead of buying music. Apple could offer songs for $0.99 which nobody was able to. At a time where a music CD was between $9 and $20. Consumers could suddenly buy single songs instead of a CD with 15 songs. Windows tried later on to compete by introducing Zune but had not such good deals with the music Industry. And if you don't offer enough music to buy, then you you are out of luck. The iPad got introduced in April 2010 when everybody said there is no market for a super sized iPhone. But the analytics were wrong, the market was there and Apple sold within weeks millions of iPads. The most successful factor for the iPad was the App Store. Over two years, the app store for the iPhone grew to over 250.000 applications. This was the perfect time to introduce the iPad. Starting with a phone is much easier, because we all had already cell phones and most of us did not like the UI. Apple just needed to make it better and was the first who allowed to have web pages short cuts on the phone, this was new. Other phones offers already a lot of apps to download but they were not easy to find or in a centralized system. Apple had no apps but short cut of web pages were at this time almost better, especially the iPhone had a full web browser not just a mobile limited version. If Apple had first introduced the iPad, it would have failed because of missing apps for the iPad. Steve Jobs said once he had first the idea for the iPad, but he was smart enough to wait. The iPad had from the beginning 250k apps (not native ipad apps). They did run in iPhone mode but consumer is able to double the size with one click. In my opinion, this was the reason why iPad has the same screen ratio like the iPhone and not wide screen. Today are over 40.000 native iPad apps in the app store and 100.000 apps which can run on iPad and iPhone in full screen size. Google is a smart company and understood fast that Apple has something going. Google came out with Android, their version of Apple iOS. Google Android phones have, after less than 2 years, the highest market share on smartphones and over 100k applications. But Google made an important mistake. They offer their Android as free open source which results in many different Android versions and many different devices. Apple was again smarter, by having only a few devices with a few different hard ware and only two screen sizes. There are basically only the iPod touch, the iPhone and the iPad. A heaven for developers. It is much easier or develop for one type of device than for 100 different devices. 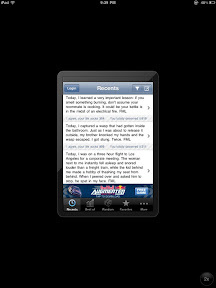 As a result apps for Apple are usually better looking and higher in quality with less crashes. Google is like Microsoft for mobile. The second mistake google did was to have an app store with no control. It is sad but true an android user does need already and anti virus software. Google tried to fix their OS concept with the tablet market by being more tied. But the hardware companies are still not yet taking any bigger share on the market from Apple. And the reason is so simple. There are only a few apps for Android tablets. Developers are not yet jumping on Android tablet development. They are frustrated and busy with Android phones. Google would have more developers if they would not have copied the idea from Apple to run apps in full screen modus only. I believe if an app would run like apps on PC in windows instead in full screen it would be easier for the developer. They could develop for one size if it fit or not. And give the user the ability to resize if they want. Of course another hurdle is to develop against many different hardware. It will take at least another 6 months till we see thousands of Android software for tablets and then Google has a big chance again. But till then Apple might have opened another market which we did not know exist. Apple did again a smart move. They bought almost the whole market on touch screens and memory. The high volume allows Apple to sell the iPads to a descent price, which so far the big competition can't really undercut. Next infrastructure step will be cloud. Apple will build an easy to use cloud Eco system which will drive more users to Apple. I see only one company, right now, which could get close to Apple. And this company is Amazon. Amazon has a good infrastructure and Eco system as well, but the hardware is missing. Amazon has the kindle, a great ebook reader and maybe is even the market leader in ebooks, but Apple proofed with the iPad, that people don't like dedicated devices. A device should do multiple things not just be an ebook reader. Amazon must (if they want to compete with Apple) come with their own mobile device. The Beauty is that it can even be running on Android. If Amazon is able to convince developers to build software for Amazon devices then the cards will be different. But till then, Apple will keep going up.